Individuals and enterprises network with others for social or business purposes to learn more about the world around them. They may focus on a particular area, and the scale and scope of networking opportunities and networking activity may vary. From time-to time patterns emerge that may present an opportunity or issue to address. This may be pursued directly or in concert with others. The outcomes of this action is driven by the relative importance given to it and the perceived capability to deliver a successful outcome. Learning capability and resource adaptability also influence outcomes as new things are explored and emerging issues are dealt with. 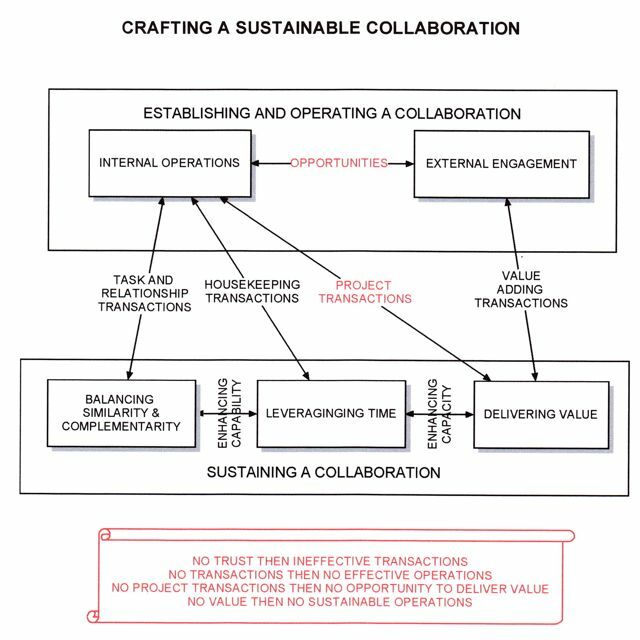 Establishing formal collaborations, engaging effectively with internal and external stakeholders, and evolving working arrangements in response to changing operating circumstances can be challenging (see http://reinventnet.org/doku/doku.php?id=collaborate). We draw on more than 20 years experience with collaborative ventures to help develop successful arrangements for specific instances. Participants have to put in time, and contributions from value adding transactions have to more than compensate for housekeeping transaction effort/cost, as illustrated below. How value is perceived however may differ significantly between participants.